There are no vampires in Steven Spielberg’s new film. 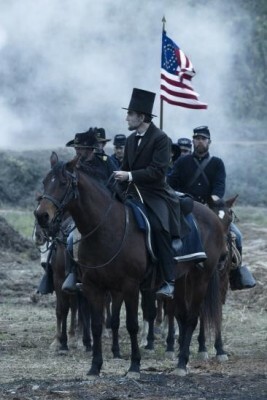 But on seeing Tommy Lee Jones’ initial scene in “Lincoln,” I thought there might be. Jones plays the cranky, Radical Republican Abolitionist from Pennsylvania, Thaddeus Stevens. There are moments when it seems that old Thad is going to take a large bite out of some pro-slavery Democrat’s neck. My, how labels and meanings change. That’s probably not the best way to begin writing about a movie that has such important things to say about stopping a bloody civil war, freeing the slaves and, of course, reiterating the assassination of a president during this vital swath of American history. In spite of the topic, “Lincoln” is awash with gentle humor to soften the blow of memories being recalled. They’re mostly in the form of those wry and famous stories Abraham Lincoln told people … whether they wanted to hear them or not. In the title role, Daniel Day Lewis is superlative, drenching himself in what has become our image of the 16th president. He gets there by fortuitously being the approximate height of Lincoln as well as having facial features that are about as close to those of Honest Abe as they’ve come. The voice and speaking patterns Day Lewis uses sound as we would easily believe are those of Lincoln’s. There are other fine actors: Sally Field as Mary Todd Lincoln; Tommy Lee Jones, as mentioned; David Strathairn as Secretary of State William Seward; Hal Holbrook as Preston Blair, the journalist/politician associated with founding the Republican Party and Joseph Gordon-Levitt as Robert Lincoln. Among others on hand are: John Hawkes, James Spader, Jackie Earle Haley, Bruce McGill and Tim Blake Nelson. 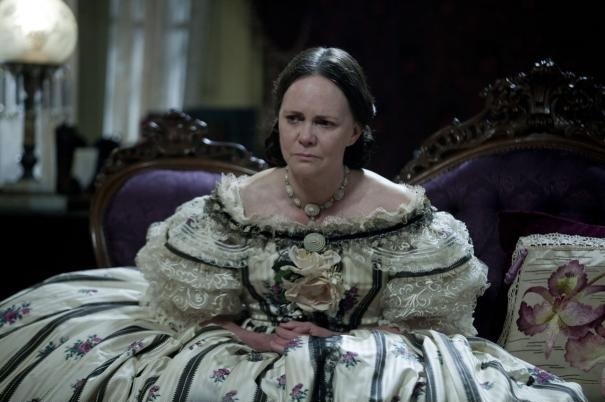 Sally Field as Lincoln’s wife. Spielberg’s penchant for presenting the lot of children in his films takes shape around young Tad Lincoln, as the child experiences those hard times in 19th century America. Gulliver McGrath plays Tad. 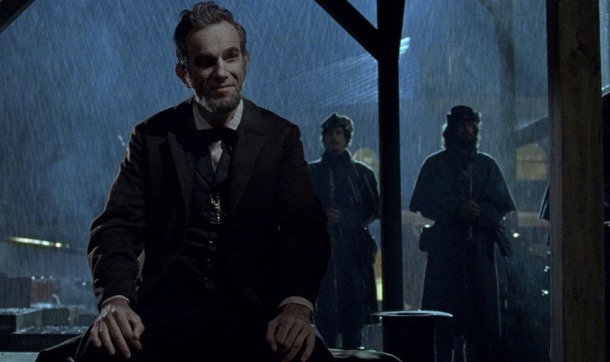 Gordon-Levitt, as Abe’s older son, is seen rather sparingly, but one of the movie’s best scenes (and there are lots of them) is a father/son confrontation between Abe and Robert about the younger Lincoln ‘s insistence on enlisting in the military. Domestic tranquility between the Mrs. Lincoln and her husband is also not always evident as the couple recounts hurtful and painful memories in the relationship. Most disagreement, though, happens in more familiar venues of Washington, D.C.
They’re the political ones among Lincoln’s Cabinet and other public servants over at the U.S. House of Representatives in the turmoil of what would become the 13th Amendment to the Constitution. After several raucous scenes of debates, it the conflict take on some semblance of what’s been going on across the U.S. these past too many months of Campaign 2012. Tommy Lee Jones as anti-slavery representative and Lincoln ally in the House. Spielberg gives a vivid, but genuine visual experience of the time, accompanied by John William’s Aaron Copland-prone music played by the Chicago Symphony Orchestra. It fits.